Our “Lif-T-Rol” die lifters are designed to fit into existing Bolster T-slots, raising the die/subplate off of the Bolster during die change. This allows for a smooth rolling surface for the tool, eliminating any shock or possible contact of the die steels during operation. Our die lifters have a lifting capacity of 2,000 lbs/ft and are mounted into a one piece machined frame. Our accessories are offered in various lengths to meet all your Die Change requirements. The “Max-Rol” die lifters are the heavy-duty counterpart to the Lif-T-Rol. The Max-Rol die lifters provide all the great features of the Lift-T-Rol, but provide a greater roller area for applications that require up to 8,000 lbs/ft of lifting force. The Max-Rol die lifter design has minimal fittings and is easy to install. The Ledge Clamps are designed to secure and position the bottom die subplate during press operation with the fast release of the subplate during die removal or changeover. 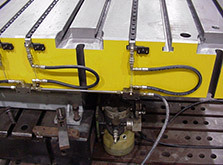 The clamp unit is also a guide rail, ensuring accurate alignment of the subplate and die. Our Bolster Extensions act as a bridge. The extension supports the die and subplate as they are pulled out of the press and onto a die cart or die transfer device. Our Bolster Extensions are designed for light, medium, and heavy duty applications. Each is available in a fixed arm, removable arm or swivel mounted arm style. Atlas’ extensions can also be used to hold small dies for pick up by fork trucks.